Only the upper leaf of this very unusual dial remains. 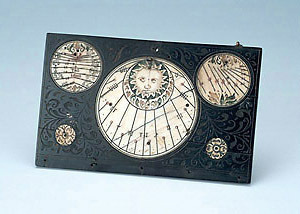 While the leaves of most diptych dials were made entirely of ivory, this one has a wooden base with ivory discs on it. The extensive decoration and originality suggest that it was probably meant to be a precious gift rather than an everyday instrument.